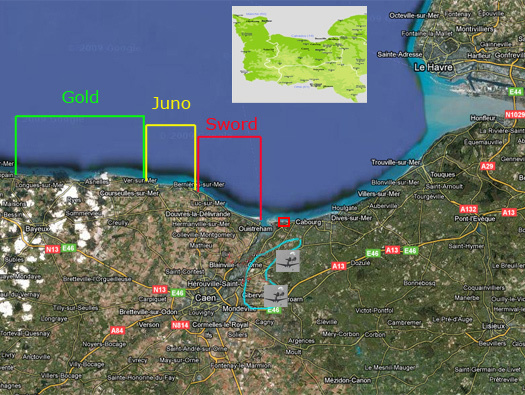 Wn03 Franceville-Plage, K.V.U.Gr Riva-Bella, K.V.Gr Caen. Franceville is a summer village between Cabourg & Ouistreham and Wn03 is the strip of dunes (now backed by houses) and runs along the beach front. 1 x R643 Fire Control Post with dome. 2 x ringstand for 5cm KwK. 3 x 5cm KwK L/40 Pak guns. R643 three embrasured turret bunker. 3P7 dome the type that would have been here. 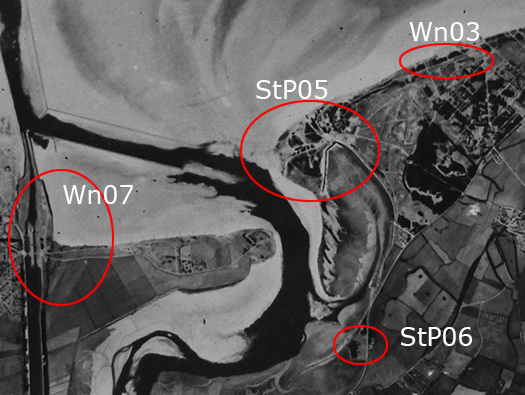 Air reconnaissance photo May 1944. The American USAAF also used Lighteningâ€™s for reconnaissance missions. Doppelschartenstand 5cm KwK L/60 Pak. 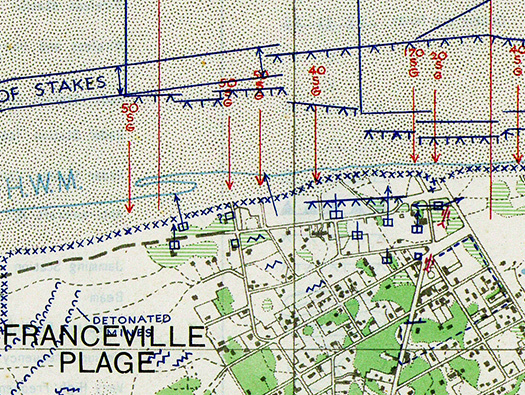 Bigot map of Wn03 showing the beach defences and known gun positions. 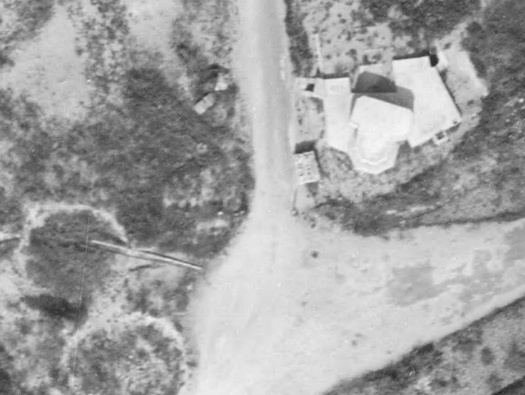 A three embrasure R643 bunker covering the left flank, a long anti-tank wall with a Tobruk defence. A machine gun stand and then a Doppelschartenstand 5cm KwK L/60 Pak. now missing. Behind a large concrete barracks, another and an R622. Anti-tank wall interestingly it has a form of camouflage built into it as it has an undulating top. Usually the wall runs along with a straight top. This is the usual wall design. A picture of the beach [Alamo]. Churchill Ark tank bridge and Churchill tank negotiating an anti-tank wall. One of the ways the British dealt with a-t-walls. The tank wall and the R643 three embrasured turret bunker. The machine gun has three embrasures covering about 160/180 deg. but could only fire through one embrasure at a time and using a periscope to help sight the gun. A 3P7 three embrasured dome for a machine gun. 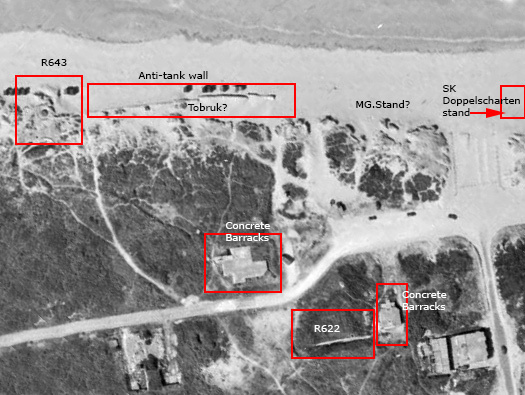 R643 uses a three embrasured steel turret (un movable) set into the concrete of the bunker. An MG34 machine gun fired on a movable mounting that could easily moved to each embrasure as was needed. 3P7 turret - crew room - gas lock - close combat room. The type of mounting that may have been used here. Close combat embrasure MG mounting covering the rear door. The nose of the bunker a solid block of steel reinforced concrete. A side view of the bunker. The turret has now been removed and scrapped and the shape on the concrete is where it was set in. An Allied plan of the inside of a dome. Bunker construction with a dome/turret in place. This is the armoured top of the periscope outer tube. The periscope would pass through this tube and it could be raised or lowered as is needed in battle. 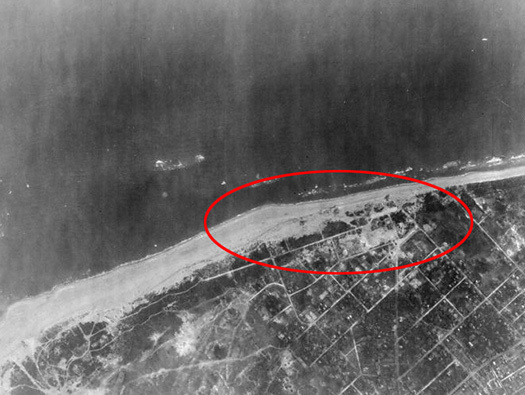 From here the bunker occupants would have been able to zoom in on the whole of Sword Beach and watched the bombing/shelling and then the landings. Nr.1694 ringstand with covered lid. An open ringstand with a lid to cover the rear and top of the ringstand. This is how it would have looked, this picture is of Wn02 Franceville-Ost. A very nice Crazy Golf course is situated behind the defence and look what is one of the features.